Windows can be easily integrated in a network. However, if you wish to allow access to a folder for other users in the LAN, it gets a little botchy. Windows features a wizard especially for this task. However, it is very well hidden. LAUNCHING WIZARD: In Vista and Windows 7, click on ‘Start’’ and enter the ‘shrpubw’ command in the search fi eld of the start menu. In the result window, click on the ‘shrpubw’ entry under ‘Programs’. When operated using a normal user account, Windows requests for the selection of an admin account and the corresponding password for the same. DEFINING ALLOCATIONS: On the fi rst page of the wizard, click on ‘Next’. In the next step, select the folder that is to be shared. For this purpose, either type the complete path under ‘Shared folder’ or select the directory using the ‘Search’ button and the following selection dialog box. DEFINING ACCESS RIGHTS: On the following page, specify the users who will have read and write access rights to the data in the shared folder. Windows offers three options in this respect, which differs between administrators, all, or other users, as well as complete access and write protected access rights. With help of the ‘User defined’ option, you can select the desired user for the access rights separately, which are registered to the PC. For this purpose, click on the ‘Add’ button under ‘Select the object names to be used’ in the ‘Select users and groups’ dialog box. Enter the names of the users and click on the ‘Check names’. Confirm with ‘OK’. The selected user now appears in the ‘Group or usernames’ list. Highlight the user and activate the access rights applicable for the account provided below. In this regard, select the checkbox in the ‘Allow’ column in front of either ‘Complete access’, ‘Edit’ and ‘Read’ entries. The selection of a user or a group and their authorization to the shared folder can be repeated similarly for other users. If you wish to allow write and read folder access to all users in the network, simply mark ‘All’ and activate the ‘Complete access’. Confirm your settings by clicking on ‘OK’ and ‘Finish’. The wizard displays a summary, which you can once again confirm with ‘Apply’. IT WORKS AS FOLLOWS IN XP: Open ‘Start | Run’, enter the ‘shrpubw’ command under ‘Open’ and click on ‘OK’, and then on ‘Next’. 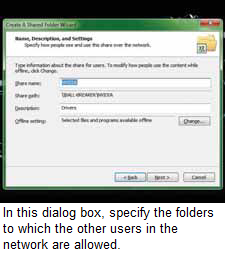 Subsequently, select the folder. In the next step, define a ‘Share name’ and, in if desired, a ‘Sharing description’ in the corresponding fi elds. As it has been explained earlier, you can now allocate access rights separately to users. ATTENTION: Shared folders are like a soft spot for possible attacks from outside. Therefore, at any instance your computer must be protected by a firewall.